A number of epigenetic regulatory layers are superimposed on the genome. In plants, small RNA regulators play a major role in the establishment and maintenance of epigenetic marks. We are interested in understanding the mechanism of small RNA biogenesis, their functions and their role in establishment of epigenetics using a number of model systems. 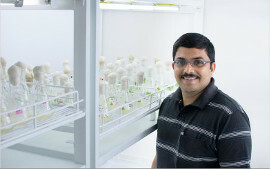 Molecular analysis of plants:- Next Gen Sequencing, forward and reverse genetics, transcriptomics, ChIP analysis, whole-genome methylation analysis, biotechnology, use of multiple model plants to study functions of small RNAs and epigenetics using molecular, genetic, bioinformatic and biochemical approaches. Basic Biology-plants, RNA biology, Plant development, Disease biology and Genetics. Biochemical requirements for two dicer-like activities from wheat germ PV Shivaprasad, T Hohn, R Akbergenov PloS One (2015). A microRNA superfamily regulates nucleotide binding site–leucine-rich repeats and other mRNAs PV Shivaprasad et al, The Plant Cell (2012). Extraordinary transgressive phenotypes of hybrid tomato are influenced by epigenetics and small silencing RNAs PV Shivaprasad et al, The EMBO journal (2012). The RNAi targeting of DNA virus in plants Poggin, Mikhail, P.V. Shivaprasad, K. Veluthambi, and Thomas Hohn - Nature Biotechnology (2003).